Advertisement is our daily routine for many years. Motoshow Plates is the right company for you if you wish to create a new replacement number plate as we have the experience and the hardware to ensure you'll get the plates you need to go safely on the road without being stopped by police and fined. We can make any kind of legal motorcycle number plates or car number plates as our online Plate Builder is designed to give you pretty much any legal plate size you may need. We are specialising in legal number plates replacement in a very unique way. Our customers are welcome to use a special designed software - the plate builder - to custom a standard number plate or a special size plate with different fonts, borders and badges. 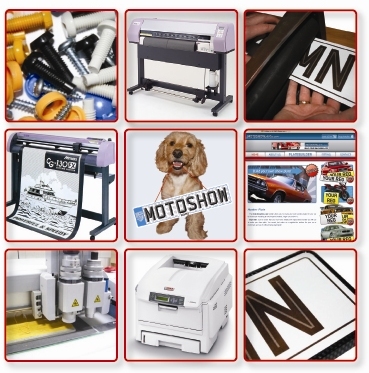 Please note, the Motoshow Plate Builder offers only legal types of fonts and badges for use on registration plates. We are all children inside who like to play and try new things. Giving our customers the chance to play by customising their own number plates is one of the keys to success. Having an online business is a great opportunity to approach thousands of potential clients wherever they are and we are happy and very grateful to be a part of this big spinning wheel.